Police at Manso Nkwanta in the Amansie West District of the Ashanti Region have retrieved the bodies of a pregnant woman and her five-year-old son, which were allegedly dumped in a mining pit. Yaa Attaa and her son, Kofi Kontoh, were purportedly killed and dumped in the abandoned mining pit by her lover, Kwame Tuffuor. The two had gone missing since last Friday from their Manso Edubiaso home after being spotted with the suspect. Residents of Manso Edubiaso, as a result, went searching for Yaa Attaa and Kontoh. Until Wednesday night, the police had been struggling to get the bodies out – two days after Tuffuor had led them to the scene. It took the intervention of some local miners to retrieve the bodies. Kwame Tuffuor had joined the search party ostensibly to look for his wife and son, several kilometres from home. He was, however, arrested when he tried to leave the community after news got to the search team that he had been seen with the wife on the day they disappeared. Tuffuor confessed during interrogation that he killed the two. He led the police to the scene on Tuesday where the almost decomposed bodies were found. He told the police how he killed his victims in turns; first, the pregnant woman after which he dumped her body into a pit. The suspect said he killed the son, who was waiting under a mango tree a few meters away in the bush. “We searched everywhere throughout the night for them but to no avail. We continued the following morning without success. Later, when we heard she was pregnant for Tuffuor, we decided to meet with him. To our surprise, he had sneaked out of town under suspicious circumstances. This is the man who has been with us in the search for the woman and her son, assemblyman for Manso Nkran Electoral Area, Ofosu Mensah said. Edubiaso Dikro, Nana Obeng Berko II, attributed the arrest of the culprit and discovery of the bodies to the intervention of the gods, who he said would be pacified. He was convinced that the call on the gods through the pouring of libation was enough to blow the lid on Kwame Tuffuor, who reportedly attempted to escape. “We will call on the gods, our ancestors and all the deities. Each one of them will intervene. We don’t want this calamity to befall us again,” Nana Obeng Berko II said. 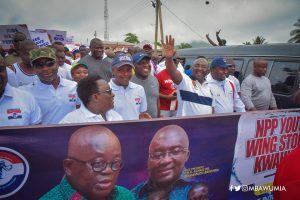 District Chief Executive (DCE) William Asante Bediako, who visited the scene with the police on Wednesday, called on the law enforcers to do a thorough investigation. “If you look at the circumstances surrounding the death, it looks like it was calculated; from the roadside to where the pit is, I don’t know if the person planned it himself,” he noted. Meanwhile, the Manso Nkwanta Magistrate Court has remanded Tuffuor into police custody on a provisional charge of murder. He will reappear on June 6, 2018.